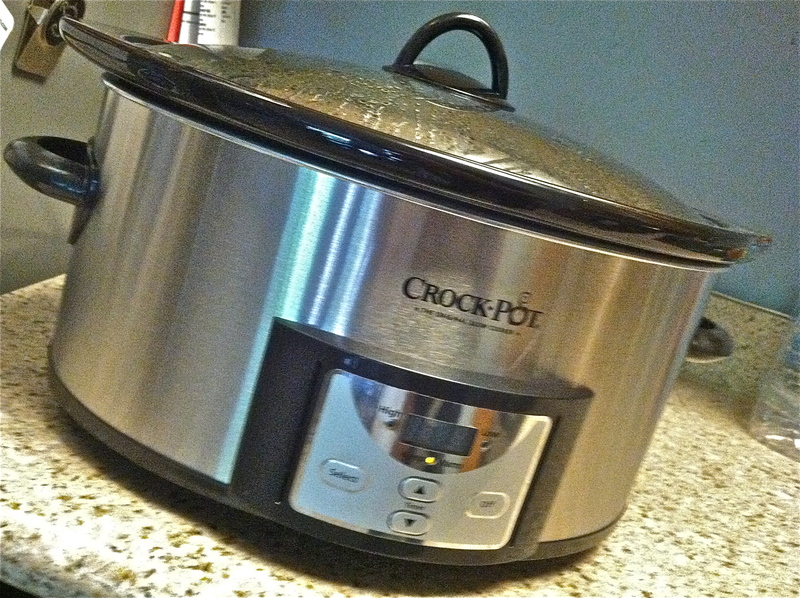 What’s In The (Brand-New) Crockpot? Part Seven | Keep It Up, David! 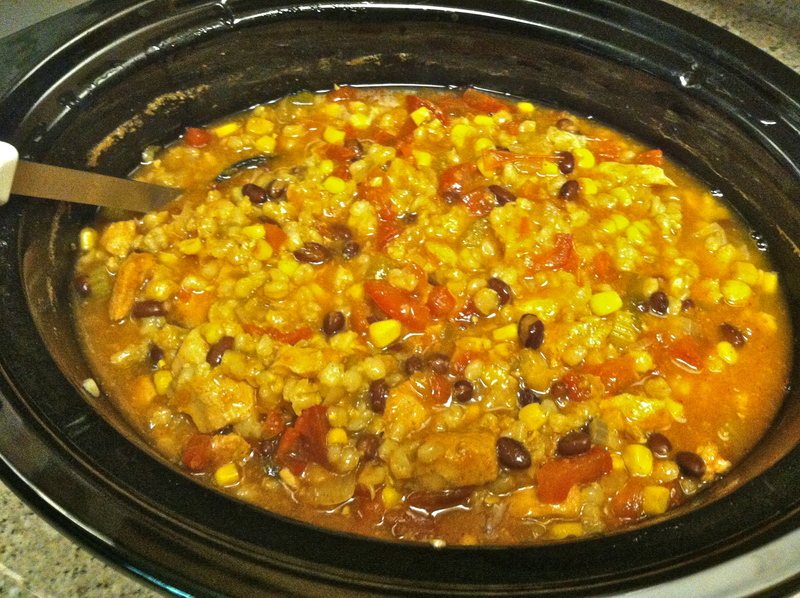 CHICKEN AND BARLEY SOUP is in the Crockpot! My mother has frequently made this recipe, and since I wanted to inaugurate my Crockpot on the last full day of her visit, I thought it would be fitting. Of course, I modified the recipe significantly, as I tend to do, so it’s not exactly the same, but it is a kindred spirit. I ate my mother’s version of this a few times before I learned that her recipe actually came from the side of a box of Quaker barley. It’s still on the side of the box, and I know that for a fact. That’s because we shopped for ingredients at a specialty supermarket that doesn’t carry many national brands, so we had to call my Dad in Michigan, who went into the cupboard, found the barley, and dictated the recipe to us over the phone. And then I started modifying. 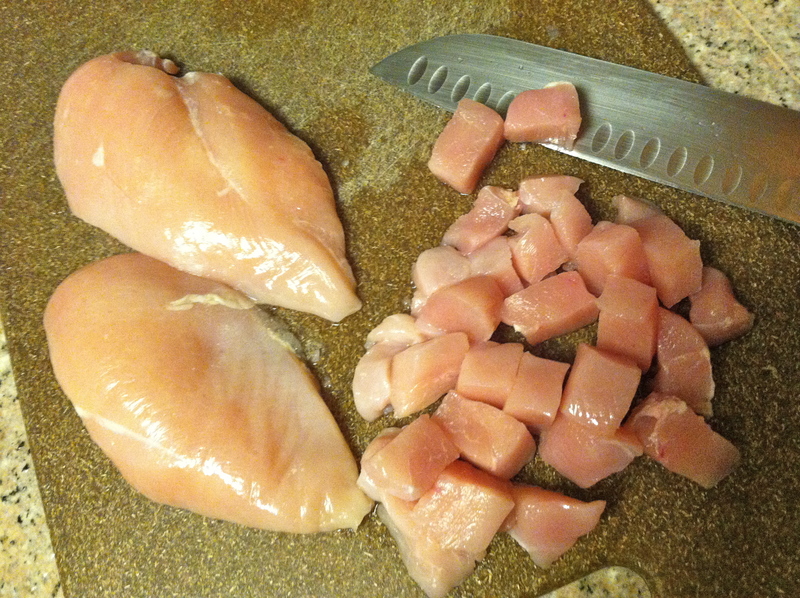 Start with three chicken breasts, chopped into cubes. They go into the bottom of the Crockpot. 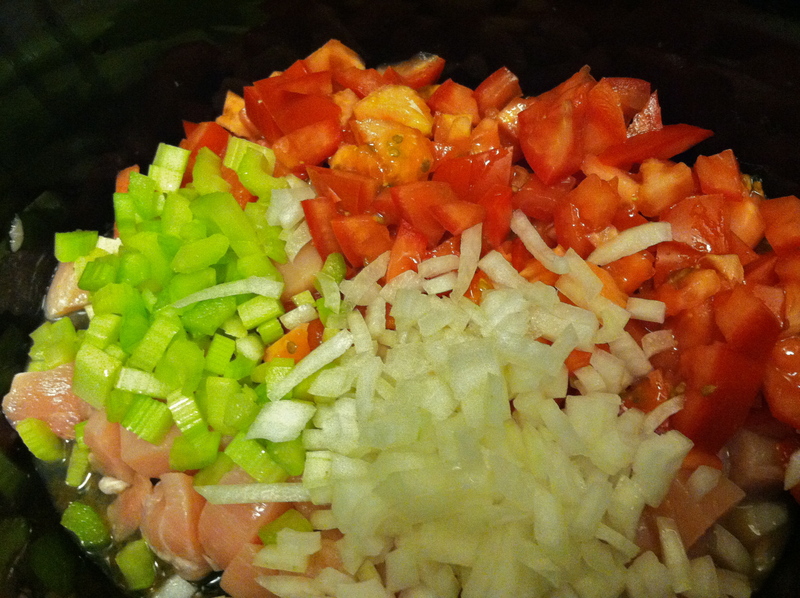 Then add 2 large tomatoes, 1/2 an onion, and 2 stalks of celery. Dice them all up so they’re roughly uniform in size. 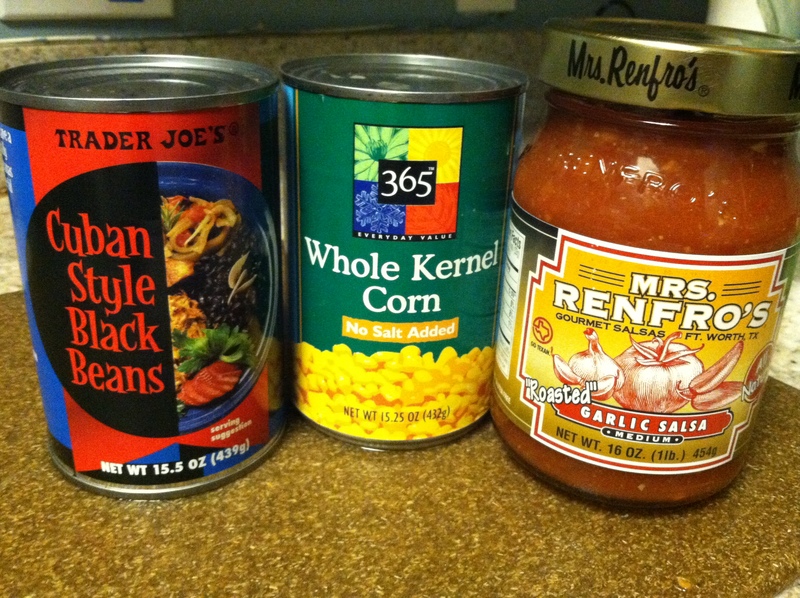 Now it’s time to add some canned goods: 1 can black beans (drained and rinsed); 1 can whole corn kernels (drained); 1 jar salsa (pick your favorite – I went with roasted garlic, medium heat). Next, the barley. The store didn’t have packaged barley, but it had it in the bulk food section. You need 1 cup, which I estimated at the store. My estimate was spot on! Finally, some liquid and spices. 14 ounces of chicken stock (I used low-sodium); 2-4 cups of water, depending on how thick or thin you want the soup. 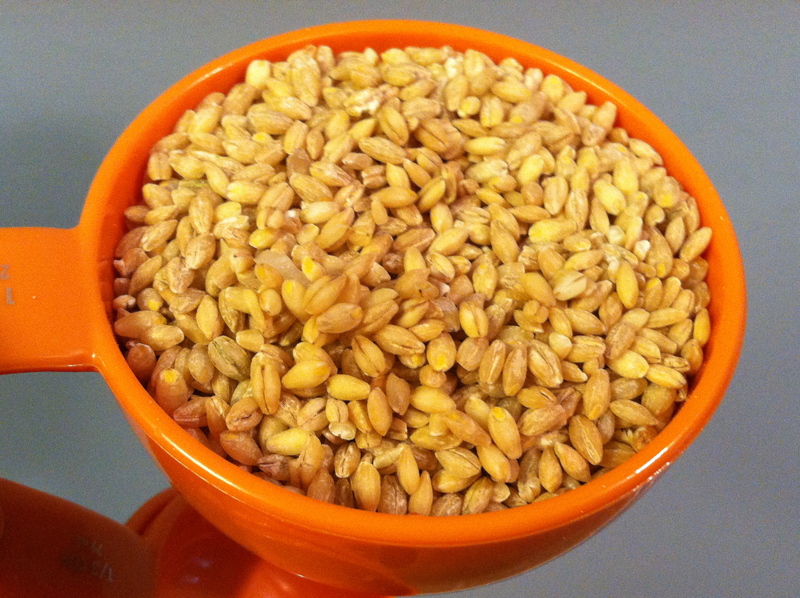 Keep in mind the barley absorbs a lot of liquid. I went with 3 cups. Then, 1 tablespoon of chili powder and a teaspoon of cumin. Time to fire up the Crockpot! I set it for 8 hours on Low. 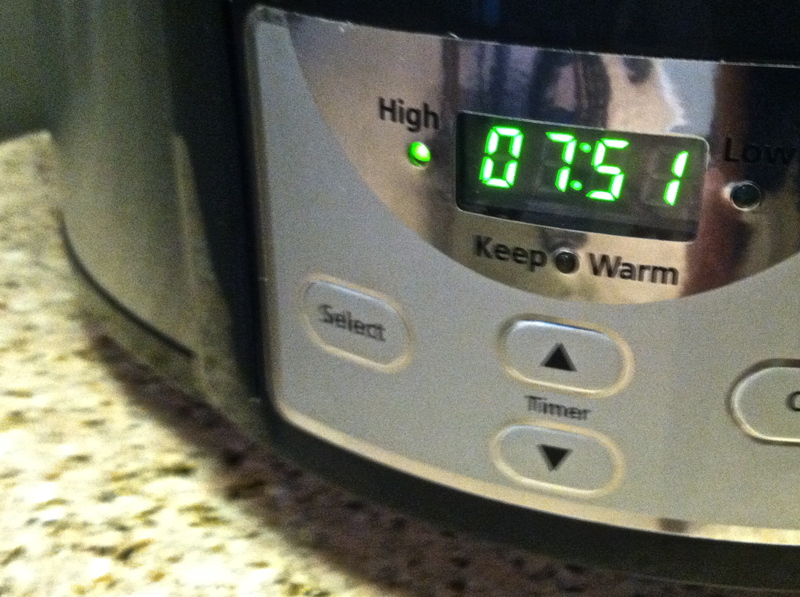 Because my Crockpot has a built-in timer, I knew exactly how much time was left throughout the day. Look, only 7 hours, 51 minutes left! If you don’t have a Crockpot, you could simmer it for a good long while in a big pot on the stove, but I would cook the chicken first, before you add anything else. My mom and I ate it with a 100-calorie Rosemary and Olive Oil flatbread. Que delicioso! 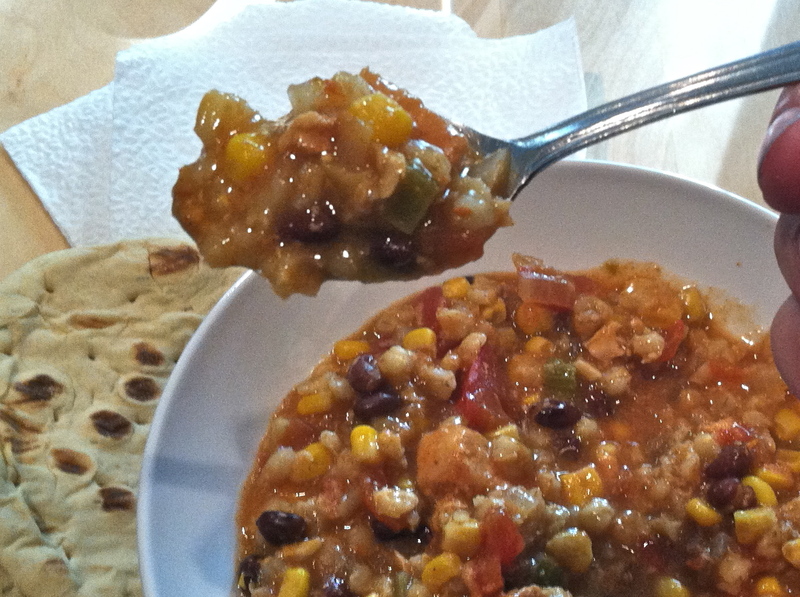 The salsa and spices provided a nice kick, and the flavors were complex and intense. 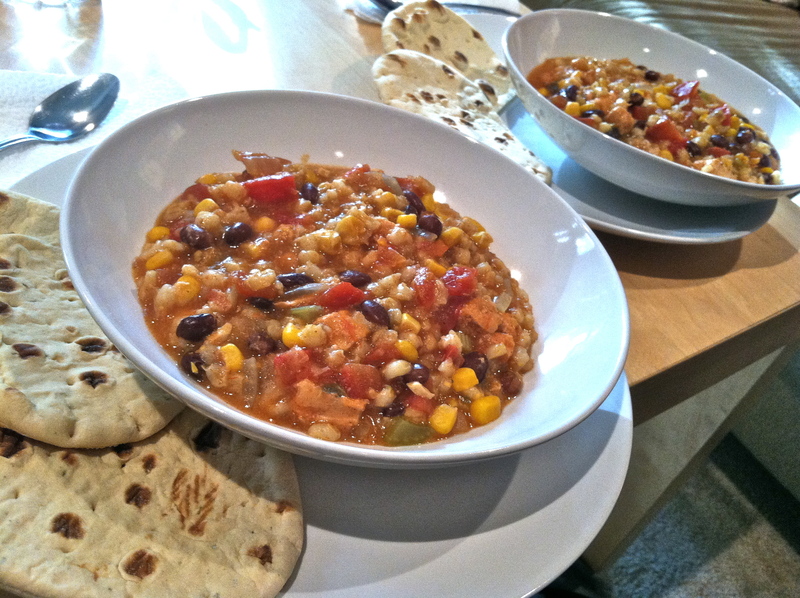 Bonus: Plenty of leftovers – I filled 4 single-serving containers! Two went in the fridge, and two in the freezer. This entry was posted on Tuesday, July 17th, 2012 at 12:05 am and is filed under Uncategorized. You can follow any responses to this entry through the RSS 2.0 feed. You can leave a response, or trackback from your own site. you are an inspiration! a brand new crock, a new job, running like a banshie in heat, and still keeping this blog going! Keep up the good work! I love catching up on your blog and it’s soo inspiring to read. My question is (I apologize if you covered this already) how did you go about changing up your food. Did you go to a nutritionist or was it you researching and figuring things out for yourself OR neither of those, lol. I’ve finally said to myself I whatever food changes I make I want to be long term (no crazy fade diets to get the lbs off quickly) but I’m a little lost as to were to start.